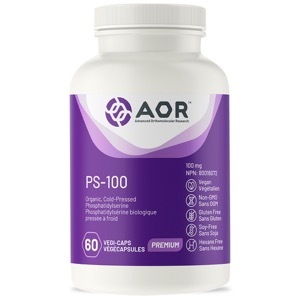 AOR Guarantees: that no ingredients not listed on the label have been added to the product. Contains no wheat, gluten, corn, nuts, dairy, eggs, fish or shellfish. Phosphatidylserine (PS) is a phospholipid that is a structural component of cell membranes but is most concentrated in the brain and cerebral cortex. Primary Uses: PS plays an encompassing role in the functioning and structural integrity of nerve cell membranes. Studies have demonstrated that supplemental PS possesses the ability to reduce cognitive impairment. Clinical trials have also shown PS to be effective in other forms of cognitive dysfunction as well, including age-associated memory impairment. Secondary Uses: There have also been several studies examining PS's ability to significantly reduce levels of the hormone cortisol, released by the body in response to stress. Research has focused on the connection between lower cortisol levels and elevated mood. Middle-aged and elderly people may benefit from phosphatidylserine's cognitive enhancing and protecting powers. It may also support athletes and those under stress by reducing the main stress hormone. Take 1-3 capsules daily with/without food, or as directed by a qualified health practitioner. Amaducc L, SMID Group. Phosphatidylserine in the treatment of Alzheimer's disease. Results of a multicenter study. Psychopharmacol Bull. 1988; 24:130-134. Casamenti F, Scali C, Pepeu G. Phosphatidylserine reverses the age-development decrease in cortical acetylcholine release: a microdialysis study. Eur J Pharmac. 1991; 194:11-16. Nunzi MG, Milan F, Guidolin D, Toffano G. Dendritic spine loss in hippocampus of aged rats. Effect of brain phosphatidylserine. Neurobiol Aging. 1987; 8:501-510. Clin. Trials J. 24: 73-83. Clin. Trials J. 24: 84-93. In, Nutrients and Brain Function, ed. Essman WB, pp. 95-102. New York: Karger.